Stretch Ceiling Systems are installed in this fashion: the profile is screw attached to the wall, soffit, frame, ceiling, or some other form of rigid structure. The membrane is factory shrunk approximately 6% smaller than the survey measurements, and is shipped to the site normally within 14 days. On site, the material is warmed up to 104-115° F, stretched, and using special spatula tools clipped into the profile system. As a final step, openings for recessed lighting, vents, sprinklers, etc. are cut and applied reinforcing rings, allowing final fixtures to be installed.A team of two professionals can complete 500-1000 square feet of a flat ceiling installation per day, as long as all the required installation conditions have been met. All the hard work is always done behind the scenes in our office and fabrication facility. The actual ceiling installation is fast, clean, and efficient. Walls, roof, and electrical work needs to be completed before the installation of the Stretch Ceiling System. A horizontal line is to be made using a laser or chalk line to identify the level where Stretch Ceiling profiles will be attached. 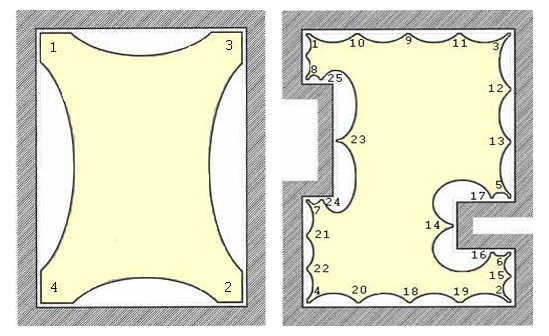 Profiles for all internal and external corners should be pre-cut and installed. All corners around the perimeter of the room should be joined together to make a continuous line. 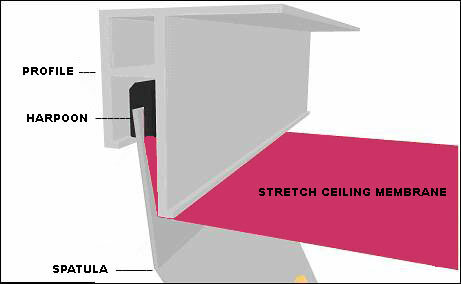 All corners and profile edges need to be checked and hand-filed as necessary to avoid Stretch Ceiling membrane puncture. Carefully unpack Stretch Ceiling, avoid letting ceiling membrane touch any dirty or unprotected floors or tools. Make sure you have clean hands while handling the Stretch Ceiling System. To speed up installation, close any cold air creators including doors, windows, a/c, etc. Once the membrane is flexible and wrinkle free, the installation of Stretch Ceiling may begin. Follow the diagram below to help to understand how the membrane is inserted into the profile. Start with the first corner and continue with each opposite corner until all corners are clipped. Once all corners have been installed, clip the Stretch membrane into the center areas. Finally, clip the remaining areas of the Stretch Ceiling membrane. Please note: Stretch membrane around pipes should be reinforced with a translucent acrylic panel. The system should not visible after installation. Curved profiles can be made to go around the pipes and other curved elements. All Stretch Ceiling membranes are generally reduced by 6%, therefore once the ceiling is stretched and installed, it remains flat and guaranteed to not sag. Accessories such as can lights, vents, sprinklers, and anything that will hang below the Stretch Ceiling System, must have support from above. The Stretch Ceiling cannot support any of these accessories on its own. Special reinforcement rings should be applied with LOCTITE Super Glue to the membrane where perforation is required.